Here's mine, all finished. I really enjoyed making this. It's beautiful! I also like the color, very ivy-ish. Hey, your Ivy is BEAUTIFUL! I have a question... did you do something different than the pattern calls for on the fronts? Specifically, where the twisted rib pattern repeats along the wrap edge? Mine isn't very well delineated from the stockinette and yours looks the way I thought it should. Anyway, just wondered if I did it wrong or if you were clever enough to figure out an even better way to do it! Malia, yes I did something a little different! I did the 10sts in pattern, then did one st in reverse stocking st up the edge to define the cable a bit better, as you would with most cables. Then I did the decreases one stitch in, as per the pattern. Ah ha! I thought so! It's beautiful... I can't wait until mine is done! Maybe I'll have to do what you did on the front when I make my second Ivy. 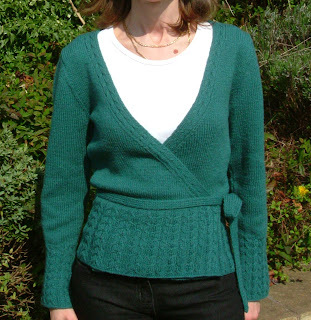 I want one in a lighter-weight yarn for summer! It's lovely jo, and I like what you have done with the border along the front, too. Maybe I'll try that for my next Ivy.